The Book Garden: The Curious Reader - Are you a sneaky reader? Are you a sneaky reader? Not many would actually admit to this, but here I am, not afraid to spill the terrible truth - sometimes I sneak a peek at the last pages of a book *gasp*. Of course I'm doing really doing this on purpose. The scenario runs more along the lines of the book accidentally slipped from my hand and landed with the pages opened to the last page and ... all right, all right that ain't the full truth. Fact is, the books needs to fall out of my grasp repeatedly until it finally falls open at the right part of the book. It's sad, I know. One should think I had perfected the process by now. Actually there are two reasons why one would want to spoil the reading fun by reading the end first. For one the book could be amazingly boring and you simply want to find out how it ends before throwing it into a corner. And then there's the situation when suspense is literally killing you and you just can't go on reading the next chapter without knowing whether things will really end the way you hope they will. Personally, when I'm bored by the book I don't really care about how it'll end. If it's a gripping plot on the other hand I've been known to battle my inner reading demons, but more often than not they win and I will eventually give in and risk a glance. Want an example? Mockingjay was one of those books where I just had to know which guy Katniss would go for. There, I said it. 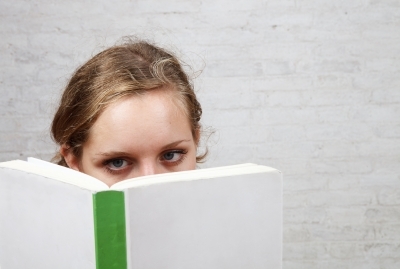 Is there a cure for sneaky readers? Actually there is a real good one, at least it works great for me. In short - read on your Kindle. Granted, you can also switch between pages, but it's a much more deliberate thing to do than, say, play the oops-the-book-fell-to-the-floor-with-the-last-pages-open-for-everyone-to-see game. So far this worked like a charm for me. I caught myself several times contemplating to get sneaky and head to the final pages, but up until now I've been a good reader and managed to resist. What it all boils down to is that sneaking a peek is a bad habit. As far as those go, satisfying your curiosity is probably not the worst thing you could engage in. Of course I wish I had the willpower to always resist the temptation, but I am at least getting better, scolding myself when I think about a lil', errr, preview and it's honestly been a while since I turned to that last page. So, I'm getting there. Curious little me and her sneaky reading habit. You might not be perfect, but you'll be in the know. Are you just as sneaky as I am sometimes? Or would you never risk a tiny look at the last pages of a book? If you do what are your reasons - curiosity or boredom? I've heard it called "killing a fairy". Personally I wouldn't ever, that reveal is the payoff and I hate it being spoiled. I never heard it called that before - learning something new every day! "And then there's the situation when suspense is literally killing you..."
It's not literally killing anyone. It's figuratively killing them. Unless they have murderous books at hand. And to answer your question: I used to peek all the time in my youth, cos I was very impatient reader (granted it was when reading stuff like Jane Austen). As I've grown older I've stopped peeking; mostly beause I appreciate the language more now, and I care more about how we get to the end. Having said that, there are some books that I'd never have finished if I had only peeked at the disappointing end, so it's a win-loose situation for me. Win-lose situation. I just pet peeved myself in adding an extra o. You see, I only wrote that to get you to comment! All right, made that one up, but you know something? I think I might write a post about bookish pet peeves sometime *making mental note*. And don't fret because of the win-lose incident - (obviously) it happens to the best of us! Hahaha! My friends (and I use the term loosely) often say things like that just to annoy me. And I fall for it every time. Also, I hate it when I make grammatical mistakes and really just need to not be obsessive but we all have our cross to bear. You're not able to stick to rules!? I'm shocked. I always sneak a peek. Not at the last page though. I will just randomly flip ahead to a section later in the book and end up having to read half that chapter, but then I sort of know where it's headed. I do not know why I do this. I just know that I always have. Maybe it's to see how far I want to read that night. As I don't just sneak a peek once or twice, but the whole time I'm reading. Especially if it's a lousy book like the one I'm currently reading, I keep looking ahead hoping it will get better. Oddly enough, the book I am struggling through right now, the main character talks about opening a book to say the 8th chapter and reading from there. Bookish pet peeves? I found one in this book I'm currently working on. Instead of putting the conversations in quotes, the author chose dashes. That type of thing. It's sometimes hard enough to follow which character is talking, but the dashes are maddening. It has given everything a stilted, staccato feel that irritates me. It is one of the reasons I have been reading this darn book for a month, and have gone days without reading it. Now that's a new one to me - sneaking a middle-peak! I try to be good about not getting sneaky, but when I do it's just the last pages. I do find myself checking how many more pages there are sometimes, but usually that's a sign the book is boring. Dashes instead of quotation marks? Now that'd annoy me too.